Rt Rev John Reid recently passed into glory and a little unpublicised story has come to light by the very people involved as to the origins of both the Australian Sports Ministry and Executive Ministry. This is the story: It was 1982. Mark Tronson, a young Baptist minister was serving two days a week with the InterChurch Trade and Industry Mission (ITIM) as the industrial padre at Shell Australia's Clyde Refinery. He stuttered and his wife Delma had 60% hearing loss (her mum had German measles when pregnant). Why anyone would consider these two people had anything going for them is one of those divine mysteries. He played and then wrote hockey for The Australian (24 years). The Sydney Christian Sports Fellowship with such luminaries as former cricket captain and hockey Olympian Brian Booth invited this young man to Hong Kong for the 2<sup>nd World Congress on Sports Mission. Mark Tronson wanted and received approval to attend by both the Baptist Union of NSW and the InterChurch Trade and Industry Mission (ITIM) who recognised that sport was a major Australian industry and recognised a providential moment. Upon Mark Tronson's return from that Hong Kong conference his report was endorsed by both the Baptists and ITIM which led to numerous meetings with Heads of Churches for the approval to develop a ministry to professional sport. The late Reverend Kenneth L McDowell the Director of ITIM and Mark Tronson duly visited the various Heads of Churches with the proposal. The appointment with the Sydney Anglicans was with Bishop John Reid. Bishop Reid noted how timely such a meeting was, as on his desk was a VHS video of the horse racing chaplaincy in Kentucky USA and he had one of his people initiating it at Sydney's Rose Hill Rack Track. Bishop Reid hitherto appointed Rev Dr Brian King as the Anglican representative for this national sports ministry initiative. Brian King was a former NSW Rugby player and highly visible as a result. This was the origins of the Sports and Leisure Ministry (since 2005 re-badged 'Sports Chaplaincy Australia'). Soon a group of Heads of Churches representatives were meeting. For 18 months it developed theologically with Brian King hosting a Theology of Sport seminar at his Wahroonga parish church and Mark Tronson ran with the vision Heads of Churches had approved. Mark Tronson was appointed the Australian cricket team chaplain in 1984, thus travelling the nation negotiating chaplaincy appointments to major Australian professional sports and became a fixture on the Australian and International preaching circuit and when preaching his stammer was almost non-existent. Bob Smith the then Churches of Christ 'Head of Church' in a NSW Council of Churches meeting, as reported in Summa Supremo the Morling theological magazine in 2005, noted when Mark Tronson visited him "with such a painful stutter this sport ministry could only be of God". A more detailed account of this story can be read in Christian Today's recent article 'Thanking God what's gone before'. It was to Bishop John Reid a few years later that Mark Tronson sought wisdom. In his role as the Australian cricket team chaplain he was meeting many business leaders in 'corporate boxes' and began developing what Mark referred to as Executive Ministries. This was a one to one ministry with corporate business persons along with the politic of the nation â cricket is a remarkable vehicle for connections. 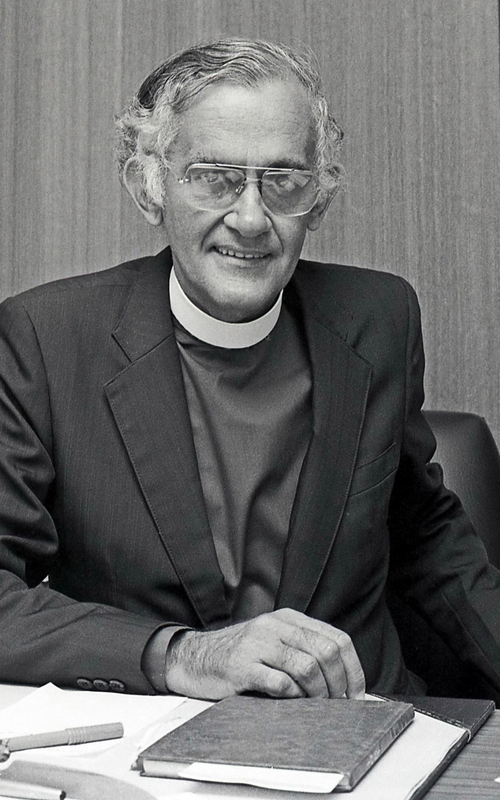 The late Rev Dr Moyes AC in his book 'Leaving a Legacy' speaks of Mark's appointing Gordon to the executive ministry of the Prime Minister and Gordon met with Prime Minister Bob Hawke occasionally in this model of ministry. A week or so after meeting with Bishop John Reid to discuss all this, the Australian Baptist President Rev Dr Ross Clifford AM reported back to Mark Tronson how at a meeting, Bishop Reid spoke heartedly on Mark's visit and to the benefit of such a one on one corporate ministry 'model' and saw fit to endorse it. 18 years after initiating the sports ministry, Heads of Churches released Mark and Delma Tronson in March 2000 from their arduous ministry. They were 'faith financed' all that time without any wage or salary, raising 4 children and even establishing a Moruya respite facility 'Basil Sellers House' for the Australian Institute of Sport. Their Olympic ministry initiated in 1984 with the support of IOC Vice President Kevan Gosper AC (and Chairman of Shell Australia) - in 2009 Mark and Delma were awarded the Olympic Ministry Medal presented by Carl Lewis, Olympian of the Century. Philanthropist Mr Basil Sellers AM has supported their family and ministries all these years, with numerous major ministries and ministry projects funded. In 2000 Heads of Churches lovingly endorsed a fresh ministry for their missionary endeavours to which they are still engaged - Well-Being Australia. Mark and Delma Tronson now focus on respite, young writers being published in Christian Today, Country Town Tours with athletes and coaches to rural and regional Australia, Art and Life After Cricket. Mark Tronson says "Lions of Christianity give spiritual breadth to ministry and Bishop John Reid was one such Giant". Dr Mark Tronson is a Baptist minister (retired) who served as the Australian cricket team chaplain for 17 years (2000 ret) and established Life After Cricket in 2001. He was recognised by the Olympic Ministry Medal in 2009 presented by Carl Lewis Olympian of the Century. He mentors young writers and has written 24 books, and enjoys writing. He is married to Delma, with four adult children and grand-children.